The Annual Overlee Crab Feast is on Saturday, July 28th from 7:00 – 11:00 pm. Cost for crabs is $49 for members/$59 for guests; BBQ is $29 for members/$34 for guests. Please bring an appetizer or dessert to share and your favorite beverages. Deadline for signing up is this Wednesday, July 25th (No sign-ups on the evening of the crab feast). Note: Crab Feast is an adults-only (age 21 and over) event. Pool closes and grounds cleared at 6:00 pm for set up. **Only crab feast volunteers will be allowed to enter before 7:00 pm. Kids (ages 5 and older) and Teens rule the pools at Overlee this Sunday beginning at 6:30 pm. We will have a DJ, pizza, drinks and snacks! Sign up now online to pre-register and get your wristband. The cost is $5 per person, including parents – everyone needs a wristband showing they have paid. Click HERE to pre-register for $5.00 and avoid the entrance lines. After 11:59 pm on Saturday, July 7th, the cost goes up to $8.00. You can pick up wristbands on Sunday from 10:00 am – 6:00 pm to skip the front door entrance line (kids may also enter through the back gate after showing their wristband). No re-entry is allowed once a child exits the pool. If not registered before 11:59 pm on Saturday, you can only pay when the front doors open at 6:30 pm and the entrance fee is $8.00. Parents: There will be no grilling or alcohol allowed. If you feel like you need to attend and you are not a chaperone, you will need to register and pay. Parent volunteer chaperones are needed to help (at no charge). If you are willing to help, please email Nico Vroom at [email protected]. Note to All OVL Members: All pools, grounds and facilities close this night at 6:00, except the lap pool. Join us for our annual 4th of July celebration! On Wednesday the 4th, the pool will open at 10:00 am. Please note: All Overlee pools and facilities will close at 6:00 pm on July 4th so the staff can enjoy the holiday. 12:00 pm: 4th of July Kids’ Parade: bring your kids and their decorated bikes, scooters, strollers, whatever, come ride around the pool deck and show off their patriotic colors and spirit! Games in the main pool, including the Big Splash contest and swim relays among others, on the deck and in the social pool. The moon bounce will be set up all day. 1:00 – 1:30 pm: Synchro See-It/Try-It Demo with the Head Coach and swimmers from the NoVa Synchro Team. 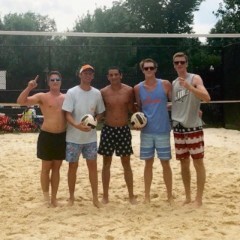 Overlee will be hosting its 10th Annual July 4th Volleyball Tournament. Sign up as a team of five or six players OR sign-up as a single to be placed on a team. Teams may include up to four guests (and yes, guest fees apply). If you have any questions, please contact our official tournament chair, Joe Kress, at [email protected]. On Sunday evening, July 8th starting at 6:30 pm, Kids (ages 5 and older) and Teens rule the pools at Overlee! We will have a DJ, pizza, drinks and snacks! The cost is $5 per person, including parents – everyone needs a wristband showing they have paid. Registration is online only this year. Click HERE to pre-register for $5.00 and avoid the entrance lines. After 11:59 pm on Saturday, July 7th, the cost goes up to $8.00. Please pick up wristbands on Sunday from 10:00 am – 6:00 pm to skip the front door entrance line (kids may enter through the back gate after showing their wristband). There is no re-entry allowed once you/your child exits the pool. If you don’t register before 11:59pm on Saturday, you can only pay when the front doors open at 6:30pm and the entrance fee is $8.00. Parents: There will be no grilling or alcohol allowed and, if you aren’t a chaperone, you will need to register and pay. Parent volunteers/chaperones are needed to help (at no charge). If you are willing to help, please email Nico Vroom at [email protected]. This Thursday, July 27th: Membership Meeting, Ice Cream Social & Synchro Show! This Thursday, Overlee is hosting the Ice Cream Social at 6:30 pm, the Summer Membership Meeting at 7:00 pm and the Synchro Show around 9:00 pm! The July Annual Membership Meeting is in the clubhouse. The meeting will begin at 7:30pm, preceded by a member social from 7:00 to 7:30pm. Come hear an update on Overlee operations, vote in the election of Board members, review concept drawings for potential modifications to the Bath House and ask any questions you may have. The fabulous “Circus Splash” Synchro Show follows the meeting at 9:00pm.